Levi Davis was born in Oxford, Mass., Jan. 8, 1782. Was a lineal descendant of the sixth generation from ancestor who emigrated from Wales. He married Mary Spurr, a native of Canton, Mass., born Aug. 11, 1782. While a resident of Massachusetts he carried on farming in Charlestown. The children born them were Redmond s., now a resident of Greenwood, George, who died at the age of four years, and Mrs. Alexander H. Stephens, for many years a resident of Greenwood, who died in September, 1866. In 1815, the family removed to Columbus, Chenango Co., N. Y., and remained one year, thence to Dryden, Tompkins Co., where they resided till 1825, and then came to Greenwood (then Troupsburgh), this county, and settled, building a log house on the present site of the Ward Hotel. The incidents of a pioneer life—settling in the wilderness, the necessary economy to support a family, the struggles with poverty and privation in a new country—were all met by this family. His first purchase was 144 acres of land, to which he made additions subsequently of several hundred acres, and during his life had in his possession considerable real estate. He was an industrious, thorough-going business man, and possessed characteristic integrity in all his business relations. He was interested in the improvements of the town, and in all local matters. He was the first to establish trade at Greenwood, and commenced in a small way to supply the settlers with the necessaries of life, and from the time of his first settlement here until the present time a mercantile business has been carried on by the Davis family, it now being in the name of John Davis & Co. The other children are Levi, born in Columbus, Chenanango Co., N. Y., and John Davis, born in the town of Dryden, Tompkins Co. He also, from the time of his settlement, for many years kept a public-house in the log house first built when he settled here, and some forty years ago built the Ward House as it now is except the third story. He was also engaged for some thirty years, more or less, in the lumber business. 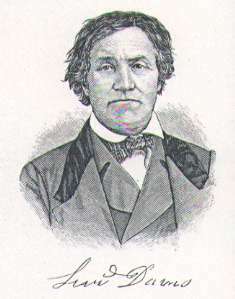 In politics he was a Whig and was the first supervisor of the town of Greenwood after its erection, and held the office some two years subsequently. He was the first postmaster of Greenwood, and officiated in that capacity some twenty-five years following the establishment of the office. His wife was known as a woman of great sympathy for the needy; was truly a helpmeet, fulfilling all the duties pertaining to a wife and mother, and did her part well, training her children in all that makes true manhood and womanhood. She died July 9, 1854, remembered for her many virtues. He survived her nine years, and died July 9, 1863. *The above information was obtained from the History of Steuben County, New York, Clayton (1879).